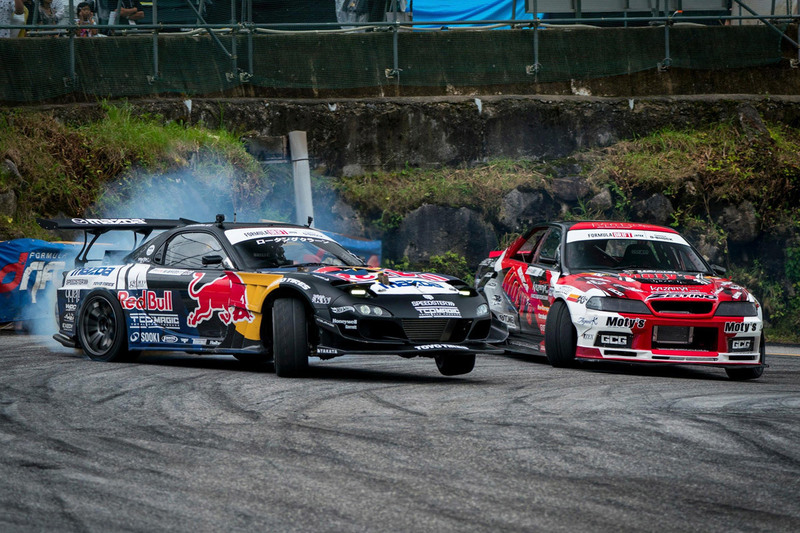 Get the full rundown on the fourth round of Formula Drift Japan from Okuibuki. 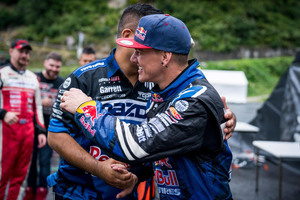 Despite their shaky start, Whiddett and the TCP-Magic team made it to Okuibuki Motor Park in the mountains of Shiga Prefecture in time for Friday's practise session, and immediately set the standard in extremely challenging conditions. 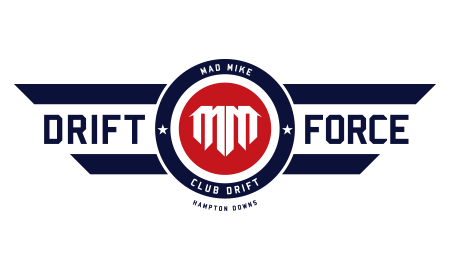 A solid 87-point qualifying performance on Saturday – the third-equal highest score of the event – cemented fourth place for Sunday's main event and a free pass through the Top 32. It was never going to be an easy drive to the final battle, but right away the team had a engine problem to deal with. Back in the pits, the electric water pump was pinpointed as the fault; it had completely seized up, meaning no cool water was circulating through the custom quad-rotor twin-turbo engine. Kawato-san and the team swapped the pump out during the lunchtime break, just in time for Whiddett to drive the 1,000+hp Mazda RX-7 onto the Okuibuki street course for the Top 16 opening ceremony. There was more trouble to come, though. During the parade the water temperature shot through the roof again, but now there were only moments to spare before Whiddett was due to line up against Yuta Nozawa. You never would have known how stressful it had been to just get the car to line by the way HUMBUL was driven on the lead pass. Anticipating the grip level perfectly, Whiddett pulled an early lead on Nozawa's JZX90 Toyota Mark II, and then maintained it through the entirety of the judged section while filling out the clip zones perfectly and keeping the RX-7 on throttle and sideways. Whiddett's chase lap was equally impressive: he tucked in close and kept the pressure applied. 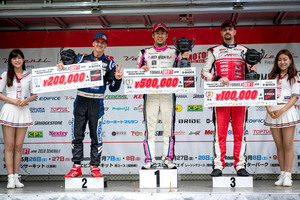 Nozawa faulted by running off-line, tapping the wall and straightening up; Whiddett adjusted his line accordingly and convincingly took the win. 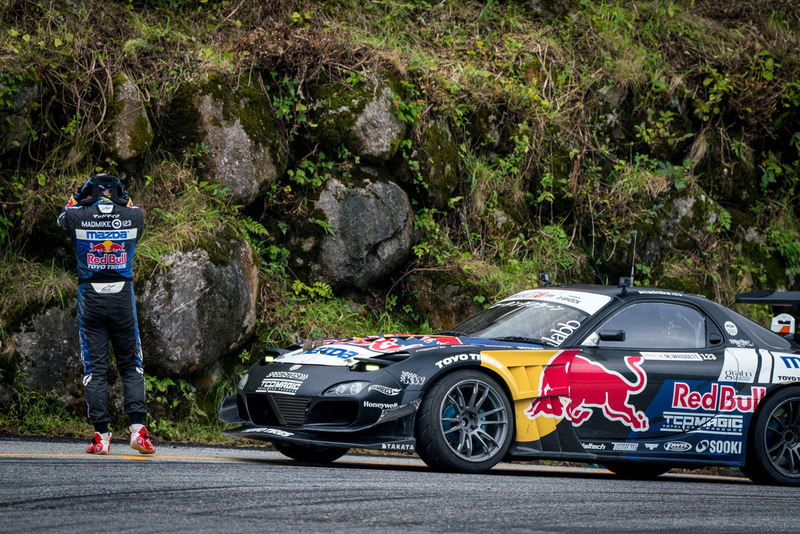 In the Great 8, Whiddett met 18-year-old Japanese drift sensation Kanta Yanaguida. Despite his young age, Yanaguida has proven himself a force to be reckoned with, but today wasn't his day. Whiddett led and once again set himself up perfectly for the first corner; Yanaguida initiated late carrying too much speed and quickly found himself in the foam barriers. The damage would have been great had the barriers not stopped Yanaguida's Nissan Silvia S13 before the rock wall behind them, but it was enough of a hit for the youngster to call a five-minute competition timeout in order to have the car checked over by his team. On his return Yanaguida put in a clean lead lap, but once again Whiddett stuck like glue in his chase and all three judges scored him the win. Whiddett's Final 4 match-up saw him face-off against Andrew Gray, who came into this event sitting third in the championship points standings. 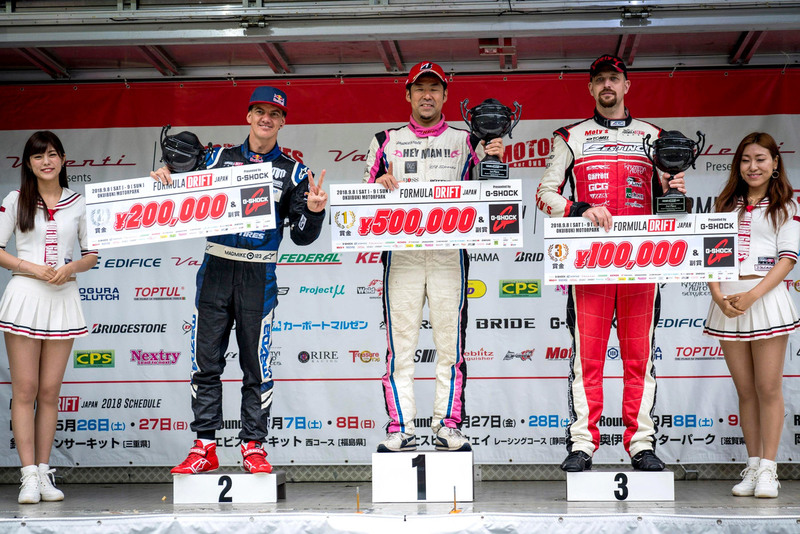 Not winning this battle could have had disastrous implications for Whiddett's Formula Drift Japan title hopes, but he kept his composure, taking the instant advantage when Gray was slow getting his JZX100 Toyota Mark II off the line following a competition timeout for a turbo oil leak. The Kiwi's lead run through the course was hard to fault: he was precise, maintained angle, kept his speed high, and filled the clipping zones. Gray's lead run was just as good, so it all came down to who chased better. Matching Gray's pace, angle and transitions, all the while maintaining close proximity, the win was Whiddett's. Grand final time. As one of the most experienced drivers in Formula Drift Japan, taking down Shinji Minowa in the final would be no easy feat for Whiddett. The pair were both awarded 87 score lines for their best runs in qualifying, but given that Minowa had scored higher on his first pass, he'd lead in his JZX90 Toyota Mark II for the event-deciding battle. Whiddett's chase was exemplary, and with Minowa losing a little angle at outside clipping zone two, the advantage was clear. All Whiddett needed to do was run one more clean lead lap; the win was in sight. But it wasn't to be. With an eventful Okuibuki round in the books, all attention is now turned to the season finale at Okayama International Circuit on the weekend of October 6-7. 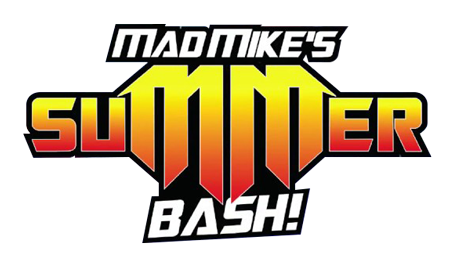 The long, wide and fast Formula 1 track is a favourite for many, and with a few drivers still in the title hunt, the event has all the makings of an epic final showdown.